How does a tomato go from green, marble-like sphere to juicy red brilliance? Chemistry, that’s how. In the case of tomatoes, the plant bathes the fruit in ethylene molecules when the fruit reaches an edible size, and this hormone triggers the fruit to ripen. We are into week eight of the weekly, online, video series “Chemistry Now,” and the chemistry of food moves into the garden as a source of interesting video and lessons. As we’ve written before, please view the video, try the lessons, and let us know what you think. I can’t think of anybody who better represented both fiery and cool personas than Neruda. Props to whoever knows why Neruda’s tomatoes showed up juicy and ripe in December; add your comment below. Video: “The Chemistry of Tomatoes” (one in a 6-part Cheeseburger Chemistry series) outlines the role ethylene plays in ripening tomatoes (and other fruits); the role of lycopene in color change; and diffusion of gas. 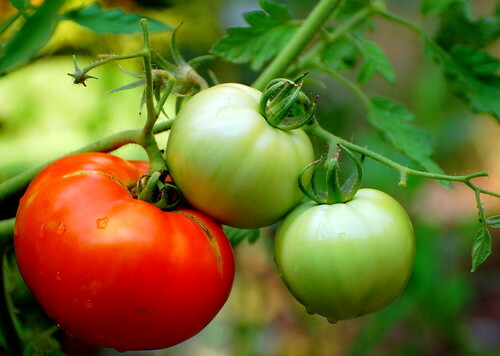 Middle school lesson: The Ripening Tomatoes lesson gives students an understanding of how tomatoes ripen and what conditions allow them to ripen the best and allows students to observe a chemical change that happens in nature. High school lesson: In this Ethylene Gas Investigation, students design and conduct an experiment to observe the ripening of tomatoes under different conditions, evaluating the effectiveness of various strategies for ripening tomatoes including the role of ethylene gas. This entry was posted in Videos and Lessons and tagged lesson plan, tomatoes, video. Bookmark the permalink. Trackbacks are closed, but you can post a comment.